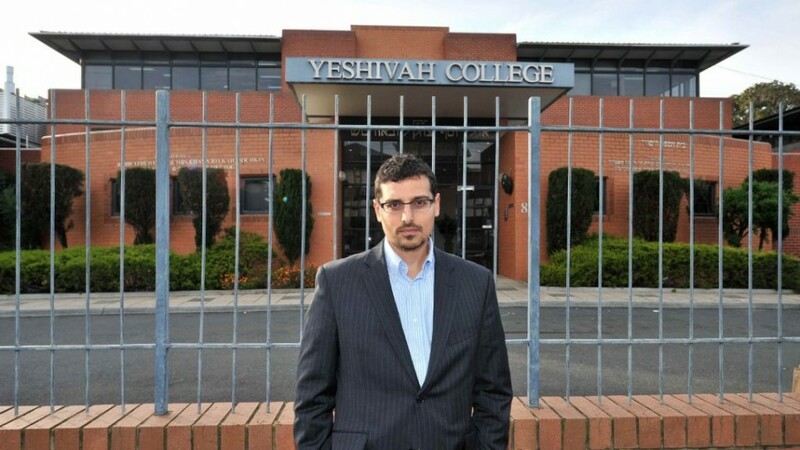 Manny Waks, the founder of Tzedek, an Australian advocacy group for Jewish victims of sexual abuse, in front of Melbourne's Yeshivah College, which has been rife with allegations of abuse (photo: News Corp). Cases of alleged child abuse at Chabad educational institutions in Sydney and Melbourne have shaken not only the Australian Jewish community but the entire nation, after a court on Monday heard testimonies as part of the Royal Commission into Institutional Responses to Child Sexual Abuse. So far the commission has heard victims who suffered under the hands of three former employees of Jewish day school institutions: Daniel Hayman, former director of Yeshiva Bondi, Melbourne youth leader David Kramer and Melbourne security guard David Cyprys. All three have been convicted for their actions. Manny Waks, an international crusader against child abuse, is the only victim from Melbourne who has broken the community’s code of silence and spoken publicly. “I know that there are many within the Chabad/Yeshivah community and some within the broader Jewish community who wish that I would be quiet about what happened to me and also in relation to my advocacy and support of others. However, I feel that as a community we need to learn from the past in order to address the future. I believe that this is something that is owed both to victims/survivors and to the broader community,” Waks told the commission. Waks was abused by two different Jewish educators as a child, and according to his father Zephaniah, two of his younger brothers were abused by a third individual. The Waks family said it has been ostracized by its former Chabad community. “We felt suddenly reduced to nothing and had lost all our friends,” father Zephaniah told the commission. Manny Waks, pictured with his father, Zephaniah, has led the campaign to expose sexual abuse in Melbourne’s ultra-Orthodox community (photo: Tony Fink via JTA). “Going public with my story over two years ago, assisting many other victims of child sexual abuse and in some cases their families, and working to protect other children within our community, has been a great part of my healing process… The decades of living in silence with the shame, guilt and anger have been shattered. Importantly, it has provided me the opportunity to turn a tragedy into a positive – something that has benefitted me and, I hope, many others,” said Manny Waks. “AVB” was also among the witnesses who gave testimony to the court. He said Melbourne’s Yeshivah had a “culture of enablers” in sexual abuse cases. AVB was abused as a 10-year-old, some 20 years ago, at Yeshiva Bondi, and by a faculty member from Yeshiva Melbourne. “There is a fundamental cultural dynamic that hasn’t been addressed. Nothing is going to change,” he stated. Australia’s Royal Commission, set up in 2013 by the federal government, is investigating the institutional environment at places known for child abuse. The list includes a church, a yoga ashram and other educational and recreational bodies. Two Jewish institutions, one in Sydney and one in Melbourne, are also on the list. The testimony given by AVB indicated the institutionalized abuse against him didn’t end when he became an adult, but rather resurfaced when he approached the police some three years ago. After vociferous public outcry, prominent yeshiva figure Rabbi Yosef Feldman resigned late Tuesday from his position as a director on the Board of Management of The Yeshiva Centre, according to J-Wire. His testimony at the commission appeared to lend credence to AVB’s allegations of continued institutional cover-ups in his request to the Royal Commission for more leniency for convicted pedophiles. Feldman’s statements were met with fierce resistance within the Australian Jewish establishment, with NSW Jewish Board of Deputies president Jeremy Spinak saying via a written statement that Feldman should be barred from a position of authority. “The evidence which has emerged in the last two weeks has been absolutely disgraceful. It reflects appalling failures in dealing with incidents of child abuse and protecting children in care,” Spinak said. Rabbi James Kennard, principle of the Mount Scopus Memorial College, one of the largest Jewish schools in Australia, called on Feldman to resign from his current positions. “While anyone who held a position of leadership in the Yeshivah community in the period when these terrible mistakes were made remains in such a position today, the community is not able to say that it has learnt and it has changed,” Kennard said. “The resignations that are required need not be an acceptance of personal responsibility, but an acknowledgement that if abuse, or a failure to deal properly with abusers, took place on an individual’s watch, then it is honorable and right for such an individual to step down,” said Kennard. The special commission will hear testimony until Friday.